Introduction: The client is one of the prominent financial institutions in Saudi Arabia, ranked third in assets. Challenges: The client was looking for a smarter B2B tool which can help them to onboard external partners with less time. Moreover, the client was also interested in the identification of performance bottlenecks. 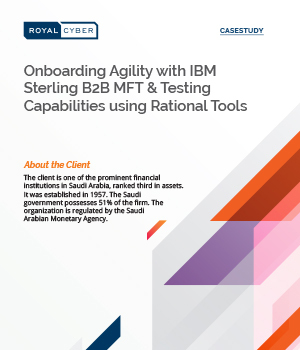 Solution: Royal Cyber implemented IBM Sterling B2B MFT Financial Edition tool as B2B Gateway which resulted in quicker onboarding and fewer data errors. Rational Performance Tester and Integration Tester helped in testing.